It’s undoubtable that Matthew McConaughey is going to win acting accolades with his incredible portrayal of Ron Woodroof, a homophobic Texan who tests positive for the HIV virus. It’s a performance that’s unstoppable with McConaughey’s conviction and brute honesty, as well as an unwillingness to show Woodroof as flawless. The man held firm beliefs against those who were different than him and his buddies down at the factory. But, when Woodroof is given the critical news that he only has 30 days to live, he’s determined to find a solution while those who once embraced his southern charm now shun him. 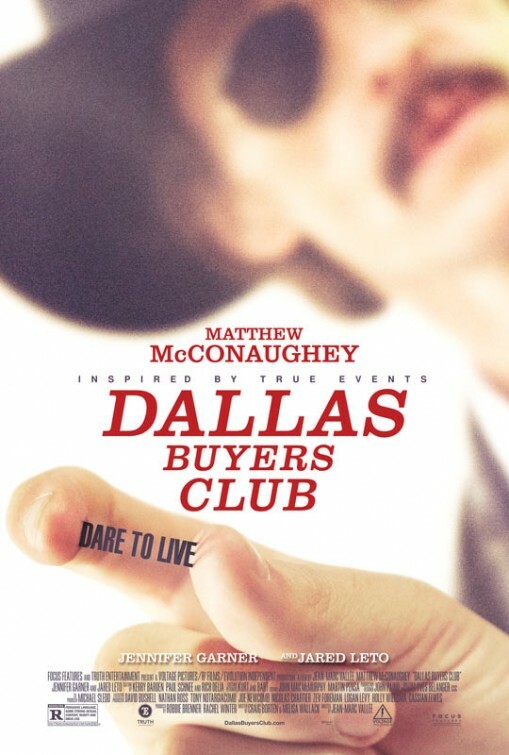 Dallas Buyers Club takes place in the mid-eighties and demonstrates really well how scared and shaken up everyone was when AIDS predominantly entered the scene. If you weren’t Woodroof, you tried to cope with others who were diagnosed with it. Such as the case was with Rayon, a transgender woman played phenomenally by Jared Leto who shouldn’t go unnoticed come award season. Meanwhile, most medics saw this as an opportunity to experiment – most notably with an FDA approved drug named AZT. AZT was fishy to Woodroof who claimed the drug did more harm than good. After finding a loophole, Woodroof organized the Dallas Buyers Club, where HIV positive patients could pay for memberships entitling them to non-FDA approved drugs from over the border. I’m bringing up a lot of award winning pre-buzz for good reason. The entire movie is worthy of acclaim from its top notch acting down to the script written by Craig Borten and Melisa Wallack. However, Dallas Buyers Club doesn’t feel like pandering Oscar bait. It’s a confident production, but it isn’t out to solely garner trophies. It’s primary goal is to tell a strong story about a relentless individual who refused to let a three-letter diagnosis get in his way. Dallas Buyers Club is an all around exceptional piece of work. It’s that rare case of feeling its beefy runtime, but not caring because Vallée and company have done such a fantastic job and use each minute to its fullest. It’s one of the best films of the year but, really, did I need to spell that one out?